"Slave Owner Issued Civil War Tokens!" Were there any slave owners who issued Civil War tokens? One’s first thought would be that the answer should be “No” since almost all token issuers were in states in the North, where slavery had been abolished before the war. But what about the border states, where slavery still existed? Could there have been slave owners there who issued tokens? The 1860 slave schedule for Lexington, Ward 2, p. 452, lists six slaves for John W. Lee: four males, ages 25, 7, 4, and 1; and two females, ages 35 and 16 years old. During the war he had a contract to provide baked goods for the U.S. Government, and most likely this is the rationale for the designation of his business as the “U. 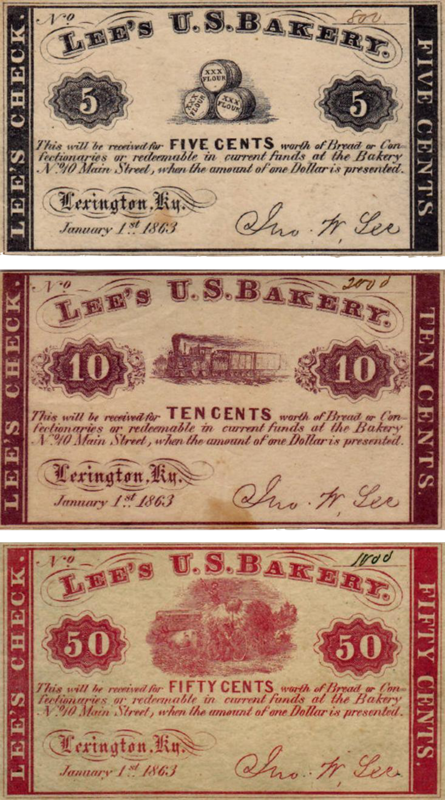 S. Premium Bakery.” Lee issued a series of paper notes or checks dated January 1, 1863, bearing the identification “Lee’s U.S. Bakery” and his signature. These checks were redeemable in “bread or confectionaries” or in current funds in amounts of $1.8 His Eden Farm may have been the source of milk distributed to customers by deliverymen who were paid with Lee’s milk tokens. Since Lee’s business was still in operation in 1864, it seems probable that it was destroyed in the last Confederate raid on Lexington by General John Hunt Morgan and his men during June 8-10, 1864. In addition to looting the city, the raiders set fire to several buildings and hundreds of cords of wood at the Kentucky Central Railroad building near the Asylum for the Insane.10 Lee’s farm, which was near the railroad, adjoined the asylum. In the 1867 city directory for Lexington, John W. Lee is listed as a gardener opposite the west end of Second St., where the asylum was located. He was no longer identified as a baker. 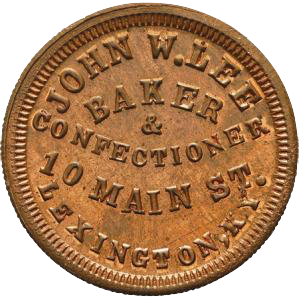 John W. Lee is remembered today for the Civil War tokens and scrip he issued during the war. These items convey little about the turmoil under which he lived and the eventual tragic end of his life. They all are quite rare: the most common of the token varieties are of rarity R-8, with 5 to 10 examples of each believed to survive. One wonders how many were destroyed when his bakery was burned, and how many of those remaining were lost following his unfortunate demise. I would like to thank David Gladfelter for providing the images of John W. Lee’s scrip checks for his U.S. Bakery. 1. Fuld, George and Melvin, U.S. Civil War Store Cards, Third Edition, The Civil War Token Society, 2014, pp. 36, 38, 58, 187. 2. One variety, KY-480B-8d, with the 1069 reverse die dated 1863, is a numismatic strike of rarity R-10 which resides in the ANS collection. 4. Kentucky Marriage Records, 1852-1914, Ancestry.com, Provo, UT, 2007 [http://search.ancestry.com/]. 5. “Fearful Tragedy in Kentucky,” Cincinnati Commercial Tribune, Cincinnati, OH, February 19, 1869, p. 6. 6. 1850 U.S. Federal Census, District No. 2, Fayette County, KY [p. 236, family #620]. 7. 1860 U.S. Federal Census, Lexington, Fayette County, KY [p. 601, family #1221]. 8. 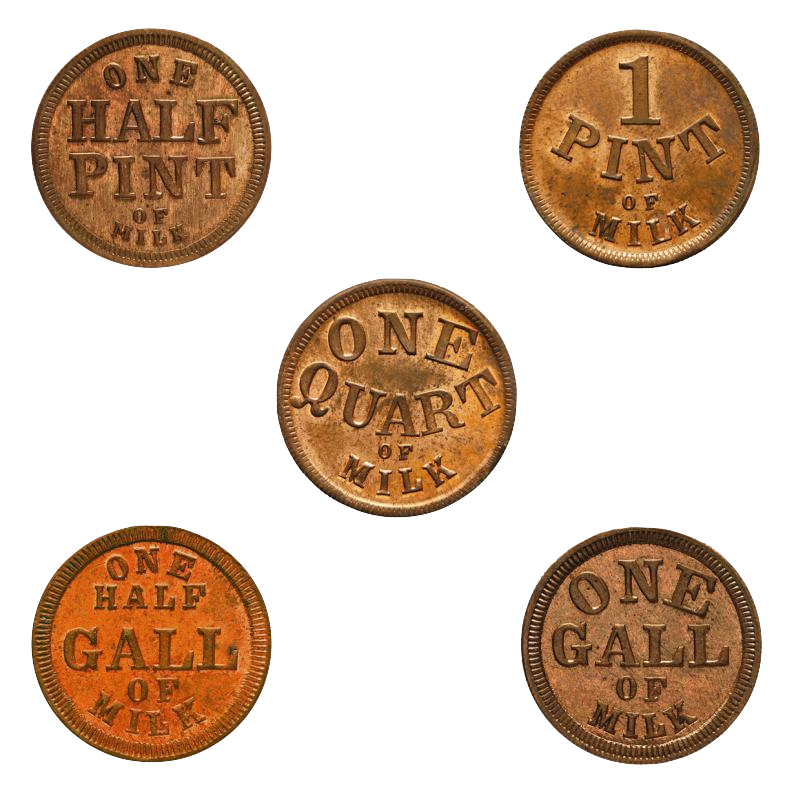 “Scrip Mates, Part 2: Kentucky,” The Civil War Token Journal, Vol. 49, No. 2 (Summer 2015), pp. 8-9. 9. “The Tragic Death of John W. Lee and His Wife in Lexington, Kentucky,” Cincinnati Commercial Tribune, Cincinnati, Ohio, February 25, 1869, p. 2. 10. “The Civil War in Lexington,” A National Register of Historic Places Travel Itinerary [http://www.nps.gov/nr/travel/lexington/civilwar.htm]. 11. “Terrible Tragedy – A Man Cuts His Wife’s Throat with a Razor and Then Cuts His Own,” The Courier-Journal, Louisville, Kentucky, February 17, 1869. 12. “Horrible Tragedy in Lexington, Ky.,” Cincinnati Daily Gazette, Cincinnati, Ohio, February 17, 1869, p. 3; “The Lee Tragedy: A True Account of the Affair,” Cincinnati Daily Gazette, Cincinnati, Ohio, February 24, 1869, p. 1; “Fearful Tragedy in Kentucky,” Cincinnati Commercial Tribune, Cincinnati, Ohio February 19, 1869, p. 6; “The Tragic Death of John W. Lee and His Wife in Lexington, Kentucky,” Cincinnati Commercial Tribune, Cincinnati, Ohio, February 25, 1869, p. 2. 13. The Lexington Cemetery, Lexington, KY [http://www.lexcem.org/index.php/]; Find A Grave [http://www.findagrave.com/]. 14. 1870 U.S. Federal Census, Ward 1, Lexington, Fayette County, KY [p. 191, family #506]; Peter, Robert, History of Fayette County, Kentucky, O. L. Baskin & Co., Chicago, 1882, p. 623. 15. Records of Spring Grove Cemetery, Cincinnati, OH.